As we near the top 6/7 of this list, Jigglypuff will get a nod, taking us back to the mediocrity of Normal types. Actually, now that I think about it, outside of Snorlax and maybe Slaking/Vigoroth, I don't think there's any Normal-type in ANY generation that I would ever want to use in a competitive setting. Doesn't bode well for some of Jiggly's other brethen, does it? No, it does not. Because Normal types are neutral against virtually everyone, they're good Pokemon to have around when you're traveling through Kanto (I think that's what this first region was called). They do a fair amount of damage to most types, but they never do a great amount of damage to anyone, barely do any to Rock, and can't even touch Ghosts. Also, the Fighting type, which, while not a necessity for any team but still often appears on one (and by that I mean Machamp is on a lot of teams) absolutely destroys any Normal type. Except maybe Chansey, but more on that later. 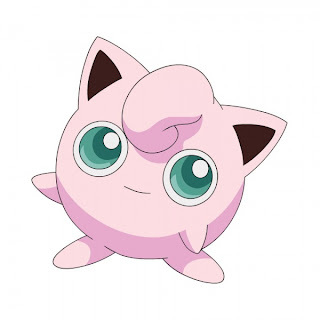 In any case, Jigglypuff is probably only even this high up because I like its song of "Jig-GLE-puff" on Super Smash Bros. (N64 version). I also like clubbing it with a baseball bat; and no, that's not cruel, for two reasons. First, it's fictional, and second, we're not entirely sure what Jigglypuff is, but an animal it ain't. In-game--the Red, Blue and Yellow games--this puff is average to below average in everything, but has a decent amount of HP, which just makes it a little more-time consuming to take out. Movewise it's got a lot of annoying things too, like Sing, Minimize, and Doubleslap, which, despite doing minimal damage, is quite annoying because it'll hit you 2-5 turns (still not sure why it isn't always twice since it's called DOUBLEslap), and those animations can take a long time. Just like I took a long time to write about how lame Jigglypuff is. Whoops.